Topics: Overview, Business Intelligence, Teleview ™, and Solutions And Services. The site has about 9 users daily, viewing on average 4.00 pages each. ns5.eapps.com, ns6.eapps.com, and ns1.eapps.com are some of its 4 Nameservers. Strategic Systems Consulting (Georgia, Norcross) is the location of the Apache/2 server. 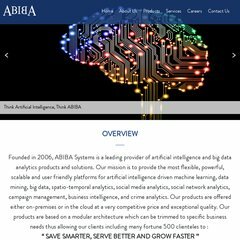 Abibasystems.com's IP address is 216.154.220.201. PING (216.154.220.201) 56(84) bytes of data. A ping to the server is timed at 51.9 ms.